Maggie from Off My Rocker my featured Artist of October has done it again. She has created a wonderful sewing pattern and will offer them for sale on her blog....I can hardly wait. So go see what she has posted today about her latest super idea. Oh my gosh, I love it! What a great pattern and he came out so danged cute. 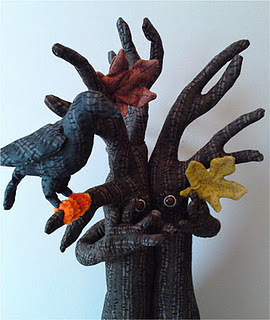 I love the tree and the crow and am ordering the pattern. I'm going to do it up in different colors for the each of the seasons. Isn't Maggie amazing? Their whole family is just so creative!